Wild berries bring back memories of foraging through the forests but as their health and flavor profiles become more widely known, they are available at many grocery stores. In season, they can be found in the produce section, but they can often be found in the freezer section the rest of the year. Use them in salads, smoothies, desserts, and whole grain dishes. 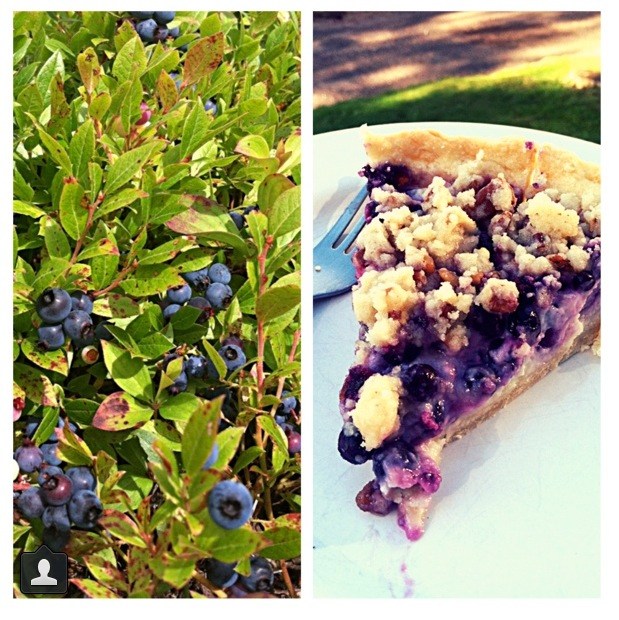 Dark blue or purple wild berries are rich in anthocyanin which is a flavonoid that functions as an antioxidant. These are all important in our cells as we age. 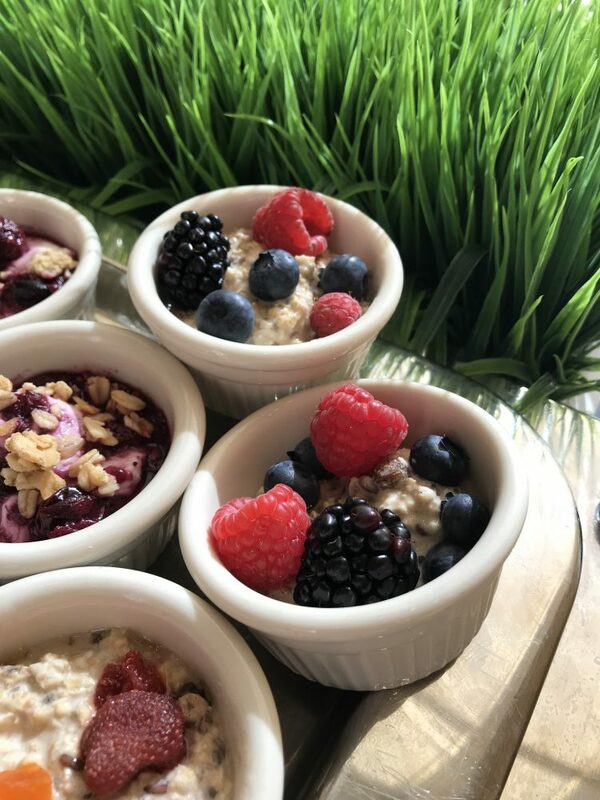 Here in the Culinary Medicine and Nutrition Lab we find that the flavor of wild berries are often more potent than the farm raised berries which might be larger but sometimes less flavorful. The flavor comes from a combination of compounds in the berries but the deep-blue pigments-called anthocyanin-in blueberries and aronia berries are responsible for the extra burst of flavor, purplish juice and the substance that can help prevent oxidation of other substances by being oxidized itself. This process is thought to be important in aging by preventing some of the changes that naturally take place as we get older. Cell damage might be prevented by a diet that includes antioxidants. One type of cell damage is inflammation. Inflammation is thought to lead to many preventable diseases such as Alzheimer’s, heart disease and diabetes. We don’t know if wild berries and other foods with high amounts of flavonoids found in the blue pigment of berries can stave off these diseases but we do know that they are an important part of a healthy diet. Researchers believe that the health benefits of anthocyanidin, found in high amounts in berries, might result from unidentified chemicals other than their role as an antioxidant. That means, taking a supplement might not capture the exact part that works to reduce the risk of cognitive decline, cancer or cardiovascular disease. Until we know more, it is best to get your antioxidants from food instead of relying on supplements that may not have the same properties as the whole berry. Combine all ingredients in a blender and blend until smooth. Serve over mixed greens, toasted pecans, blue cheese and other salad fixings. Aronia berry syrup is such a beautiful color. Combine it with honey and it makes a great syrup for pancakes or crepes. 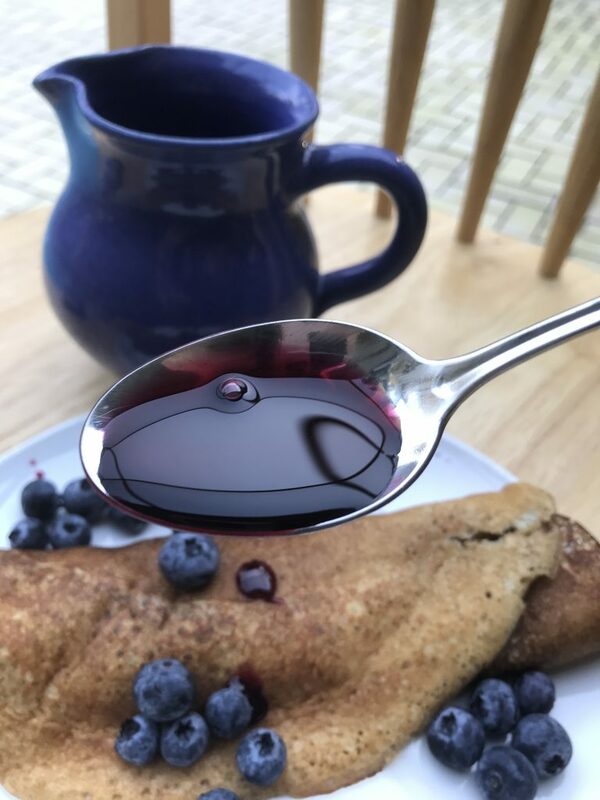 Our honey has an unique flavor and is a really good sweetener for Aronia Berry Vinaigrette although you can use any honey you have available. Aronia berries have very little natural sweetness and can be eaten plain but if you are not use to the astringent taste, a little honey or other natural sugar can be used in the recipes. Honey is primarily fructose and glucose with a few other complex carbohydrates included. The smell, taste and color of honey depends on where the bees find their nectar they bring back to the hive. 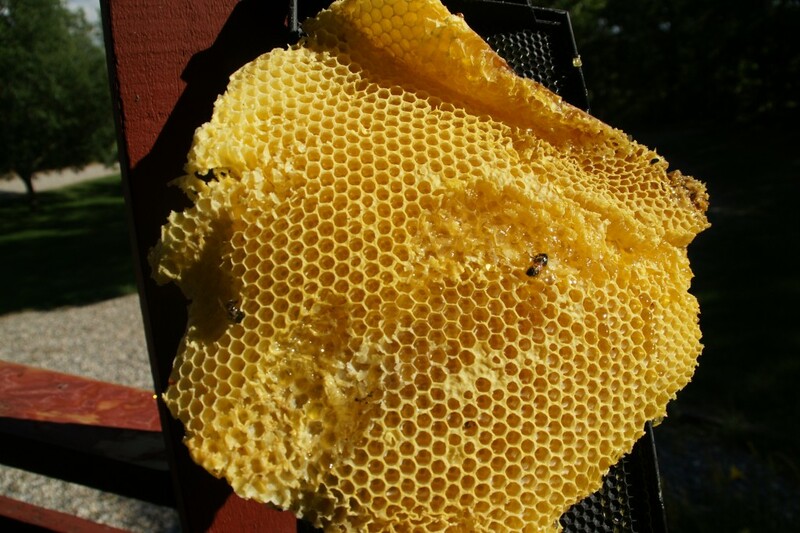 Honey has some B vitamins and minerals depending upon the vegetation near the hive. Most wild honey will contain vitamin B6, thiamin, niacin, riboflavin, pantothenic acid and a few amino acids. The minerals found in honey include calcium, copper, iron, magnesium, manganese, phosphorus,potassium, sodium and zinc. While the vitamin and mineral content of honey is very small and we eat honey in small quantities, it still is a really nice addition in our recipes with berries. Wild Berries are often smaller but more flavorful and have higher concentrations of anti-oxidants. 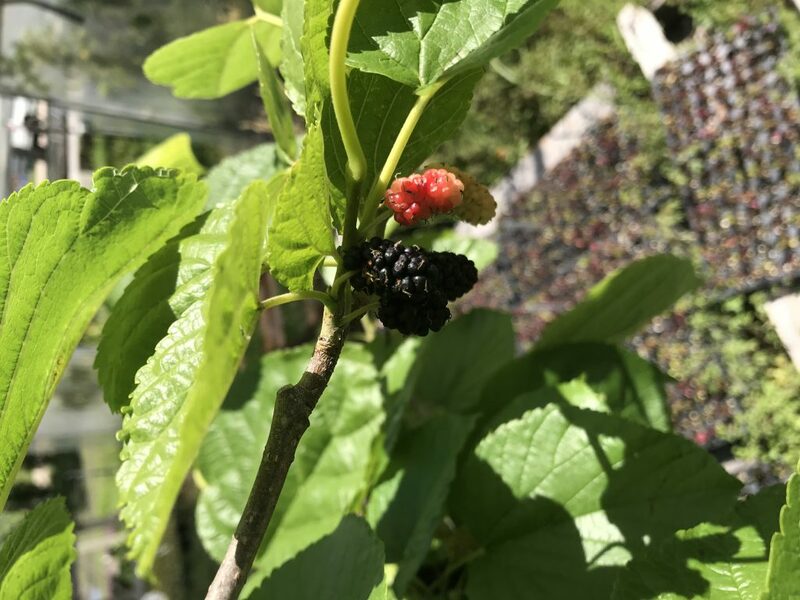 Mulberries were ready right near my birthday and I always loved picking them from the trees in the fence rows. Place crust in 9-inch glass pie plate. Fold edge under, crimp, freeze 10 minutes. Prick with fork. Bake at 375 degrees until sides are set about 12 minutes. For filling, mix first 6 ingredients in medium bowl to blend. mix flour and butter in medium bowl until small clumps form. Mix in pecans and sugar and sprinkle on top of pie. Bake for 15 to 20 minutes or until lightly browned.